In order to meet our oversea market customers requirement,Now,We are launching English version Cable Marker TP76E, The main feature are faster print speed, higher print quality, convenient and timely customer service and so on. 1. Allows you to print directly on tubes label tape and heat shrink tube ,automates half and full cuts. 2. It allow to print on tubes(0.5-6mm diameter) and label tape(6,9,12mm). 3. English operation interface with English spelling input functions, another location input method for choosing, input English, numbers, symbols etc to achieve various edits. 4. Large white backlight LCD can display 7-row-and-2-column input contents. Each row can display 14 English letters. 5. Push-to-Talk (PTT) can generate various functions with only one key to operate conveniently. 6. 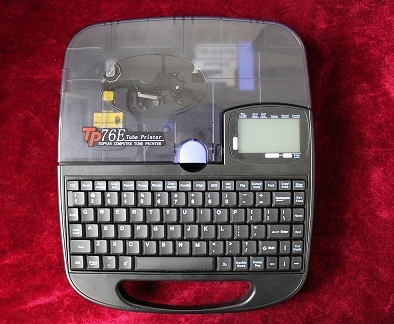 Truly international and standard 85-key English notebook computer with a full keyboard. 7. When there is any switch on/off and any error operation, the machine will send a ticking sound to prompt. 8. Supvan Cable Marker TP76E can realize the automatic nip function of print head and the automatic half/full cutting functions. 9. Supvan fonts and TTF are very beautiful so as to make the printing effect be clear more. 10. The unique setting of test key may be convenient for you to monitor the machine status and accept the machine performances. 11. The unique setting of cursor print key may realize the print of contents between any two row intervals in file. 12. The powerful built-in file memory capacity may memory 100 different files for easy calls at any time. 13. Supvan high-speed computer Cable Marker TP76E can be connected to any computer. Supvan software has a fully new man-machine engineering interface with powerful functions. It is suitable for Windows 2000/XP/Win 7 operating system and can realize independent operations on the work site. It can be used as a dual-purpose machine. 14. It has a portable design and is suitable for use on various occasions. 15. It has a hard suitcase to protect the Cable Marker effectively.